To be a master chef, one must have an incredible amount of culinary expertise and creativity to create a wide variety of dishes. To be a computational astrophysicist building planets in simulations, it feels a lot more like going to the store and buying a box of pancake mix. Instead of buying all the ingredients, you start with a pre-made mixture. From there, all you have to do is just add water! Simulating planets can be quite similar. In place of the pancake mix, you can start out with a ball of rock. From there, all you have to do is just add gas (see Figure 1). When making pancakes, one thing to be careful about is how much water to add. If you add hardly any water, you will just end up with the same dried-out bowl you started out with. If you add way too much water, you will end up with pancake soup. Unlike in cooking, there’s no recipe to follow when building a planet; you do not get to decide how much gas to add! A planet must accumulate a particular-sized atmosphere based on its own properties and the properties of the surrounding protoplanetary disk in which it forms. 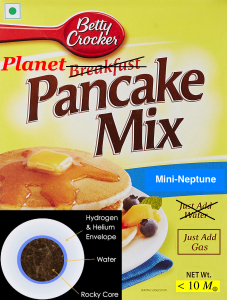 Mini-Neptunes are the “perfect pancake” of planets. They ended up with just the right amount of gas. Any less and they would have stayed Earth-sized dried-out rock. Any more and they would have grown to Jupiter-sized gaseous soup. 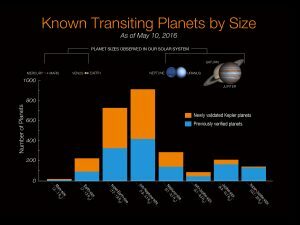 In today’s paper, Julia Venturini and Ravit Helled explore which planet and disk conditions are best for building planets that have just the right-sized atmosphere to be classified as Mini-Neptunes – the most common type of exoplanet (see Figure 2), even though there are none in our solar system. Mini-Neptunes are defined to be planets that are less than 10 times the Earth’s mass and have a heavy, hydrogen-dominated atmosphere that makes up between 10 and 25% of the planet’s total mass. (Most planets that are at least 1.6 times the Earth’s radius in size are likely Mini-Neptunes or bigger. Any smaller planet is more likely to have a lighter atmosphere and be classified as a Super-Earth or an Earth.) With Mini-Neptunes being so common, we would naturally expect a wide variety of conditions to be favorable for forming them. However, it seems easy for planets to avoid becoming Mini-Neptunes. The smallest planets have so little mass that they struggle to accumulate a significant amount of gas. For comparison, the Earth’s atmosphere only makes up <0.0001% of its total mass. 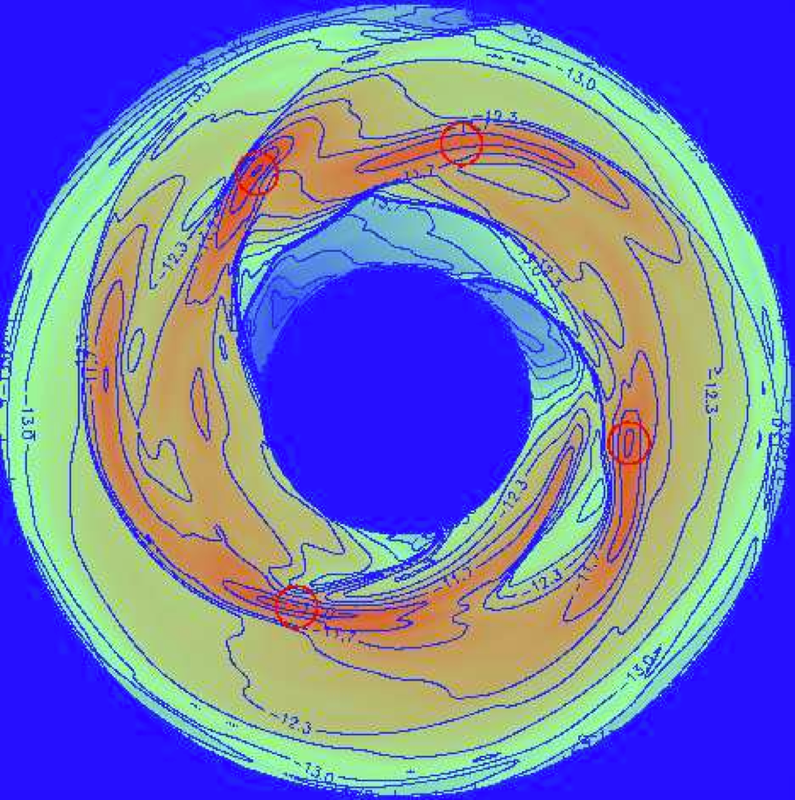 On the other end, bigger planets whose atmospheres reach the mass of their rocky cores become unstable and undergo what is called “runaway gas accretion” in which they can easily grow to Jupiter-sized (318 Earth masses) or larger. This would not be a problem if Mini-Neptunes could just stop growing once their atmospheres reached a fractional mass between 10 and 25%. Unfortunately, as long as there is a disk from which they can accrete gas, they will keep growing. This would be like if you poured the right amount of water into your bowl of pancake mix, but then were forced to keep pouring water until you ran out! Thus, the only way a planet can end up a Mini-Neptune is if the gas in the disk dissipates away at just the right time for the planet to have accreted just the right amount of gas for its atmosphere. 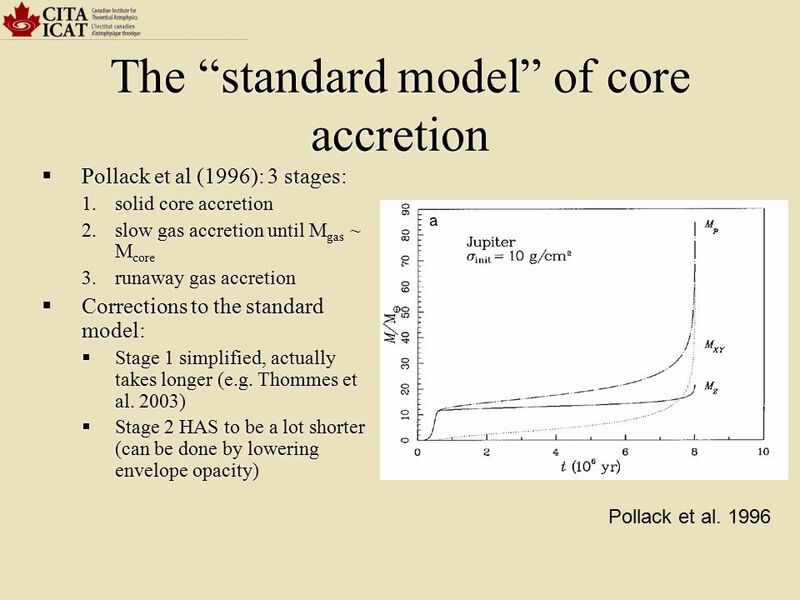 The authors simulate the growth of a planetary core that starts out 100 times less massive than the Earth in the presence of a depleting gaseous disk enriched with small rocky material. In the 1st stage, only the rocky core grows. In the 2nd stage, the planet becomes massive enough to gravitationally attract a sizable amount of gas – at which point, both the core and the atmosphere continue to grow. They then repeat this process with different planet and disk conditions. Here, the planet is placed at 5 AU with a transparent atmosphere that is just hydrogen and helium (non-enriched). The planet’s core then grows very quickly and bursts past the upper limit of 10 Earth masses in a little over 1 Myr (Case A: dashed blue lines in Figure 3). Before 2 Myr, the atmosphere’s fractional mass already exceeds the upper limit of 25% and the planet is well on its way to growing to Jupiter-sized within 3 Myr – the average lifetime of a protoplanetary disk. With these conditions, Mini-Neptunes should never form. Let’s move the planet out to 20 AU. Being farther away from the star slows down the growth of the core (since there is less material to accrete at these distances, while the planet also orbits much slower). Unfortunately, it also slows down the growth of the atmosphere for the same reasons (Case B: dashed purple lines in Figure 3), again preventing Mini-Neptunes from forming. To speed up the atmosphere’s growth without speeding up the core’s growth, the authors enrich the atmosphere with water (which is more realistic). This makes the atmosphere heavier, allowing it to gravitationally contract faster – freeing up space to accumulate more gas into the planet’s atmospheric zone. With these conditions, the planet reaches the Mini-Neptune phase, but too early! Before 2 Myr, the planet has once again accumulated too much of an atmosphere (Case C: solid purple lines in Figure 3). Figure 3. Left: Planet mass evolution over time for planets that do not become Mini-Neptunes. The black components of each line refer to when each planet crosses the Mini-Neptune stage. Right: Atmosphere fractional mass as the planet grows. Each line switches from thick to thin after 3 Myr (the average disk lifetime). Adapted from Figures 2a and 3a in the paper. To slow down the atmosphere’s growth, the authors make the atmosphere more opaque. With a high opacity, it is harder for heat to escape. Since the atmosphere cannot cool as quickly, it cannot contract – making it harder to accumulate more gas. As a result, the planet will become and stay a Mini-Neptune from 2 to 4 Myr, right when the disk is expected to dissipate (Case D: solid purple lines in Figure 4)! With these optimal conditions, Venturini and Helled find that 40% of protoplanetary disks should be able to form Mini-Neptunes depending on the exact lifetime of the disk. Figure 4: Case D forms a Mini-Neptune, as the average disk dissipates at just the right time (vertical red line at 3 Myr) for the planet to end up with just the right amount of gas (and total mass). Adapted from Figures 2b and 3b in the paper. Besides finding that Mini-Neptunes can form from pebbles at 20 AU as described above, the authors also find that Mini-Neptunes can form from km-sized planetesimals closer in at 5 AU in 83% of systems. Between these two types of accreted material, Mini-Neptunes should be able to form easily in a wide range of locations for a variety of atmospheric properties. With these results, it is no surprise Mini-Neptunes are so common in the “Kepler sector” of the galaxy.